Alan Wayne Allard, born December 2, 1943 (age 75), is the former United States Senator from Colorado and a member of the Republican Party. On January 15, 2007 Allard announced he would fulfill a 1996 campaign promise to serve only two Senate terms and retired in January 2009. Allard was born in Fort Collins, Colorado to Sibyl Jean Stewart and Amos Wilson Allard. He was raised on a ranch near Walden, Colorado. Allard attended the public schools in Walden and Fort Collins, Colorado. Allard received his Doctorate of Veterinary Medicine from Colorado State University in 1968. While completing veterinary school, Allard married Joan Malcolm, who received her degree in microbiology, also from CSU. They then founded their veterinary practice, the Allard Animal Hospital. 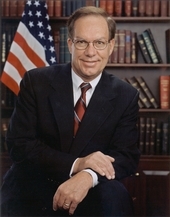 Allard was elected as a Republican to the One Hundred Second and to the two succeeding Congresses, and served from January 3, 1991, to January 2, 1997. Allard was not a candidate for reelection to the House of Representatives in 1996 since he successfully ran for Senator. Senator Allard was elected as a Republican to the United States Senate in 1996 and reelected in 2002 for a term ending January 3, 2009. Senator Allard was a member of the powerful Senate Appropriations Committee. In the 110th Congress, he served as Republican leader of the Legislative Branch Appropriations Subcommittee, in addition serving on the Interior, Energy & Water, Military Construction, Transportation, and Financial Services Subcommittees.